It looks like the Jihadis are trying to take over Lebanon. 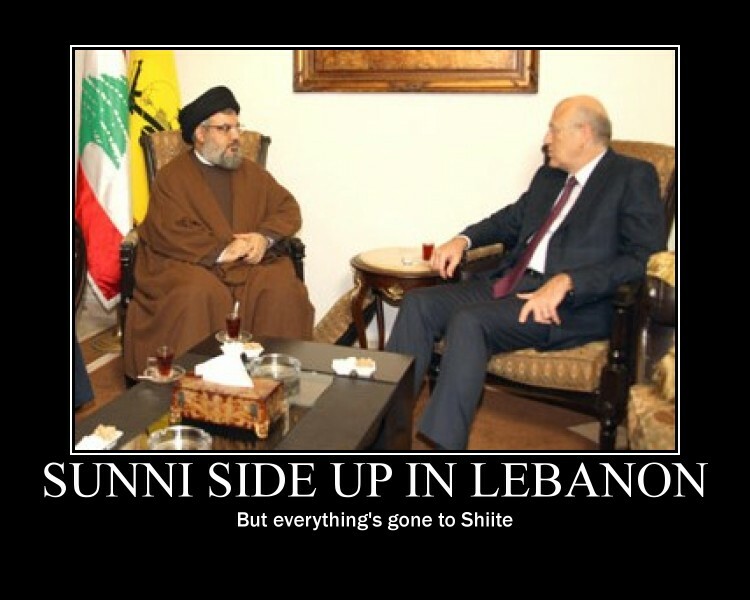 It was mostly the Sunni Muslims of Lebanon that let loose today in Lebanon in a fit of rage over the continued move by Hezbollah to take over Lebanon…which culminated with Hezbollah’s nominee for Prime Minister Najib Mikati garnering more parliamentary votes than the present Prime Minister. Hezbollah has named their puppet leader, a former Prime Minister, and he won by 8 more votes – the news did not go over well with Sunnis and I’m sure it didn’t go over well with Christians and Druze, either. 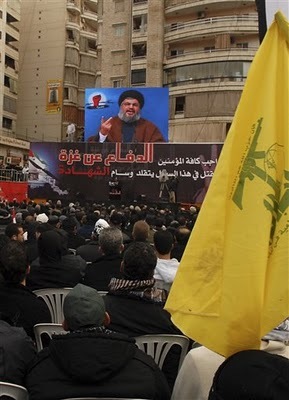 \ BEIRUT – The Shiite armed movement Hezbollah cobbled together enough support Monday to appoint Lebanon’s next prime minister, effectively ending nearly six years of rule by Western-backed leaders and prompting the United States to warn it could cut off aid to this key Arab nation. The apparent strength of Hezbollah marked an important political achievement for the group. It also signaled what appeared to be a significant shift for the country, away from alliances with the United States and Saudi Arabia, and toward Iran and Syria, which support Hezbollah. The United States considers Hezbollah a terrorist organization. A prominent government role for the group could compel the U.S. government to list Lebanon as a terrorist state. That designation would carry with it the automatic suspension of aid, a possibility that Crowley acknowledged. The United States has sent about $1.2 billion in economic and military assistance to Lebanon in the past five years, and the Obama administration has requested $246 million more this year. Hezbollah and its allies agreed Monday to support Najib Mikati, a Sunni self-made billionaire, for the prime minister’s post, a decision that could be confirmed by the full parliament as early as Tuesday. To say that Lebanon is a bloody mess right now would be the understatement of the year. And now, we are seeing that the terrorist group, Hezbollah, is undergoing training exercises to actually seize the capital city of Beirut. I say bring the war on. 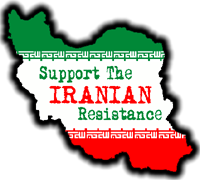 Hezbollah is just a proxy for Iran but I think Israel can easy totally take them down just don’t hold back this time. I found a very interesting article written by Michael Totten. Hezbollah and really the rest of the Islamofaciasts have been employing a strategy for years on how to eventually destroy Israel. They attack, lose, regroup, refortify, and attack again. While they continue this cycle unbroken, they indoctrinate their children to hate all Jews through the most insidious form of child abuse known to any civilized society. These children are so thoroughly unable to even think critically about a peaceful coexistence by the time they are young adults, it may very well be that it will take another two generations before the concept has any chance of working. Another good news alert (gotta get it in while it lasts) is the fact that the anti-Syrian parties have won more seats in Lebanon’s parlaiment than Hezbollah. More here and, here. (IsraelNN.com) Anti-Islam parties scored big victories in European Union parliamentary voting that concluded Sunday. A record low voter turnout of only 43 percent helped the right wing parties enter the EU Parliament (EUP), while the conservative European People’s party retained its plurality, by a comfortable margin. In the Netherlands, Geert Wilders’ Freedom party won 17 percent of the country’s votes, giving it four out of the country’s 25 seats in the 736-seat EUP. Its support placed it less than three percent behind the ruling Christian Democratic Alliance’s showing. Wilder has set off violent protests in the Muslim world because of his 15-minute film called Fitna, which links violence with the Koran. He also is working with Israeli Knesset Member Aryeh Eldad (National Union) to expose violence in Islam. Arab/Muslim sanctimony is intriguing. In his wrath, Teheran’s Chief Prosecutor, Sayid Mortazavi has charged 34 Israeli commanders and 115 soldiers with war crimes, in the wake of Israeli defensive measures against Hamas. The Hague is reviewing. More coverage on the likelihood of this actually amounting to something can be found here. Google is your friend. There are several sites that are reporting on this. Israel seeks to put a stop to the constant barrage of Qassam, et al., rockets which have been launched from Gaza schools, mosques and hospitals. These rockets have been deliberately directed at Israeli kindergartens and other civilian targets for the last 8 years. Where is Mortazavi when Hamas TV, Palestinian TV, and Lebanon’s al-Manar TV are all busy airing various “educational” children’s programs’ such as the likeness of Mickey Mouse spewing hateful Islamic supremacist messages via the mouths of babes, Hamasnik rabbits threatening to eat Jews, and otherwise encouraging innocent children into vicious hatred and prejudice, brainwashing these children into valuing themselves only for their potential as human bombs??? Here’s the $64,000 question: Where is Disney?!? The Walt Disney Company is known for jealously guarding any trademarked images, to the point of threatening to sue daycare centers in the US, should they have the temerity to paint murals of Mickey Mouse on their walls without prior permission, possibly including steep licensing fees. Judge Judy, where are you when we need you?? Getting back to the point, if Mortazavi wants to go that route, I suggest some international law specialist draft charges against Hamas, Hezbollah and any other organization which involve themselves with such activities. Charge them with child abuse related war crimes, and present those to the Hague. 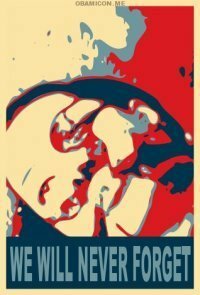 Any organization that can be proven to be actively indoctrinating children to glorify suicide in any form, or that encourages them to become suicide “martyrs”, or that clearly allows or coerces children into becoming combatants/child soldiers, military couriers or in any other military capacity– should be charged with war crimes. If any parent can be proven to be encouraging their children to become suicide bombers or to enter in military zones to engage soldiers in any manner, then that parent can be subject to charges of parental incompetence, or child abuse, and can then be vulnerable to loss of said children. If a parent can be proven to be cooperating with organizations, such as Hamas, Fatah or Hezbollah, that make a practice of using children in their conflicts, or of indoctrinating their children to commit suicide, or to entering into a military conflict when they are minors, then those parents can be subject to the same charges. If parents feared they would lose their children when abusing them in this manner, we might see a very quick reversal in these activities. I’m sure there are many international law experts capable of drafting sufficiently specific and effective charges to this effect, and introduce them to that bastion of truth and justice, the Hague. More excellent articles on the subject of Israel’s right to self defense, and what actions do constitute a violation of international law HERE. No, I’m not recommending jumping a jihadi. Seems they have the corner on that market. I was jumping around from one jihadi story to the next today…it’s just amazing what a bunch of trouble these folks are stirring up and how wimpy Western democracies are in response. I think we’re stymied because we are under the impression that what we are confronting are religious fanatics, and whatever we do, we don’t want to stifle freedom of religion. Get that out of your heads as fast as you can. Islam is not primarily a religion. It is an all-encompassing, all-controlling political system with an inseparable religious component to it. An article by Spengler at the Asia Times gives us some perspective on Islam, defining it as both a religion and a political ideology. Spengler cautions us that it is this combination which makes Islam dangerous. Another way to view Islam can be found at Jihad Watch, in “Islam 101” by Gregory M. Davis. In his words, it has been “transformed Islam from a relatively benign form of monotheism into an expansionary, military-political ideology that persists to this day.” It is easy to observe, in most cases, that Islam as it is interpreted and practiced today, can’t seem to live alongside or tolerate democratic, representative governments. These elements together make Islam in our day positively toxic. This does not mean I hate Muslims. The system is the problem. Had I been alive when slavery was an accepted insitution, I would have been an abolitionist. Does that mean I would have hated people of African descent? If this is a comparison that seems a non-sequitur to you, just check this site out, and then watch some videos by Dr. Wafa Sultan, Ayaan Hirsi Ali, or Walid Shoebat. I have some here, or you can peruse the stock at Youtube, or Google Video, or get yourself some good books by any of them. Islam, as it is packaged and sold by the jihadis, is not the ultimate society, in spite of it’s more fanatical adherents insistence. It is the ultimate fascism. Jews attacked with a steel bar in Antwerp, Arab bulldozes Jews in Jerusalem, Jews grabbed by a security guard at U of Toronto seminar, threatened with beheading with a saw!! (now that’s rude). While last night had higher profile anti-Zionists and anti-Semites, what with Naomi Klein and Sid Ryan, tonight had greater righteous indignation of the “oppressed Fakestinians”. Notably, with Jews visible in the audience, the audience was repeatedly told from the dias that no photography or recording of any type was allowed by anyone without “media clearance”. On a number of occasions organizers tried to force me to depart with my camera, though I had not taken even one shot. i told them that when everyone with a cell-phone leaves or gives up their phone i will give up my camera too. Later, during questions, organizers, ” security”, surrounded the area where visible Jews were seated. A Jew asked a question: “Is Hamas’s charter racist “? That question then become the focus of vitriole, the “security” closed in around the Jews, security then started to push the Jews, then the dias demanded that the Jew leave the room. The Jew replied out loud that he would not depart unless told to do so by the Police. They came in from the lobby, and that ensued. While this went on, I pulled out my camera and started to shoot. All manner of people closed in around me, and tried to obscure my lens. I got a few shots, and left for the lobby to catch the newly-evicted Jews’ fate. Organizers were demanding my photos, and my name. They got neither, though it will be next to impossible to be anonymous tomorrow. For my efforts, a Police Sergeant came up to me and pushed me out the front doors using his chest and flack-jacket against my chest. I asked him why i was being pushed out the doors and he said that. “you know why”. Why? Because I look Jewish? Because I was photographing the altercation started by the islamo-fascists? OR, because he is brown ? Oh, but I can’t make that silly, facetious, suggestion, all while being profiled myself ………. Then There Was Light and other sites are carrying the same story. Website on sign is http://www.alburuj.com. The site requires a log-in just to visit. Because they’re asking “allah” for a horrific destruction of 6 million Jewish souls, I suppose we’re not to construe this as Muslims threatening Israel. Hm. I wonder who they think “allah” would be using to carry out his will. Anybody with ideas…please comment. You’ll hear that line of reasoning towards the bottom of this post, also found at Wikipedia’s article on the Islamic Thinkers Society. Glenn Beck interviews a guy named Jesse. I.T.S. threatens jihad against America. Robert Spencer is also threatened by the I.T.S. (that’s a weird one). So, most of us have probably told someone to go to hell, and that is harsh. But I wouldn’t pursue legal action against someone who hopes I go to hell and says so. Hell, I might even laugh at him, slap him on the back. Hard. Spencer might want to consider it on this one. Isn’t the above threat a bit over the top? I thought death threats weren’t protected speech? Or does the fact that these men pray out loud that their god will do these heinous acts protect them? Do they actually get to hide behind that, when their descriptions are so gruesome?? I was perusing Jihad Watch…and found some links hacked. Same with WorldNetDaily. I notified them, because I actually do believe in freedom of speech. I’m sure those sites are kept busy by the religion of peace. One of the links that was hacked was to a video of the man who called a woman he disagreed with a whore at an I.T.S. demonstration. I have embedded that video below. He is a Jewish convert to Islam. Sad. So very sad. But what about the fact that several anti-American, openly jihadist, foreign entities, now operate on American soil? Here’s a video on this that will really curl (or straighten, whatever you need) your hair. 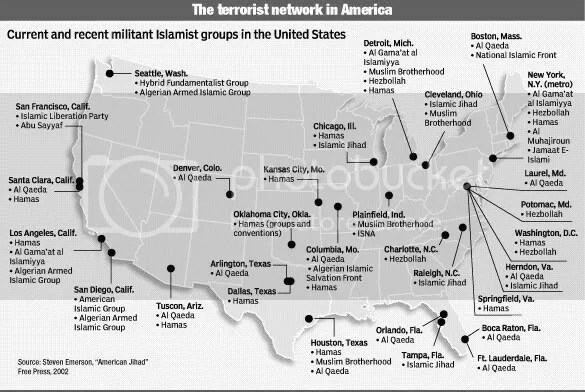 During the course of my reading today, I ran across another organization that keeps tabs on jihadist activities — Militant Islam Monitor.org. Very worthy of our attention. We’re all watching each other these days aren’t we? Something’s gone haywire. Oh. Yeah. Our constitution isn’t being implemented. The one that the jihadists now openly tell Americans needs replacing with sharia (Islamic law) under a khalifate. That constitution. The constitution that our government officials take an oath to defend, along with “all enemies, both foreign and domestic”. Don’t these people, who call for our deaths, for the end of our chosen method of government — sound like enemies to you??? Of particular interest on the Wikipedia site regarding the Muslim Thinker’s Society is the link on the bottom entitled, “A Glenn Beck interview of a member of the Islamic Thinkers Society. Glenn hits pretty hard. Sorry, it’s a soundfile not a video. Below is a video and a photo one of the guy’s from I.T.S. calling a woman a whore. It can be clearly heard at the beginning of the video. In response, the woman tosses coffee on him. One of his buddies begins asking in a demanding tone, repeatedly, “Will you arrest her?” Several witnesses kept insisting that the man called the woman a whore. This is so typical of Islamic behavior. They start the fight, the victim defends himself, herself, or in the case of groups, nations etc. they then go complaining about the response!! How about let’s not go picking fights guys?? The guy is a Jewish convert to Islam, a member of Islamic Thinker's Society, expressing his thoughts. He calls a woman he is arguing with a whore. Later, in the video, you'll here him call women who are speaking up on the first woman's behalf "children" and "filthy", and claiming they don't know how to have a discussion.